Made of soft neoprene with a wide cut and supremely-cushioning air cell padding, the Zeiss Air Cell Comfort Strap is available as an optional upgrade for use upon all Zeiss binoculars 30mm and larger, as well as many other makers' binoculars. 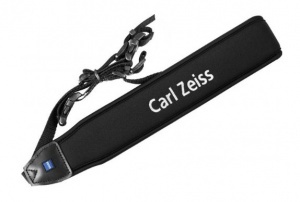 The Zeiss Air Cell Comfort strap is slightly contoured to better fit around the neck, but can also be used upon a shoulder, and is a significant upgrade to the standard neoprene strap supplied with today's Zeiss binoculars. 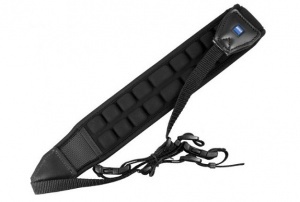 A built-in quick release allows the main body of the strap to disconnect from the webbed portion, so that you can use it as a hand strap in a pinch.